The "WEGO Health Podcast" debuts with a celebration of their "WEGO Health Award Winner Series"! 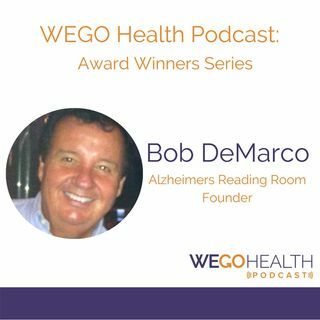 On this episode Host, Shane Schulz interviews Bob DeMarco the Founder of the Alzheimer's Reading Room celebrated for winning Best In Show Blog! The Alzheimer's Reading Room is the number one source of information in Alzheimer's care, dementia care, and for those who are caregivers of dementia patients. Published daily since July 2009 AlzheimersReadingRoom.com has ... See More had more than 6,000,000 unique visitors who have benefited from the information it provides with its over 5000 expert articles! Bob's award-winning blog was possible due to his out of the box thinking, allowing him to continue a wonderful relationship with his Mother Dottie who was affected with Alzheimer's Disease and Dementia. 6:54 - Bob shares a short story of how “Taking a Step to the Left” improved his relationship as a caregiver with his Mom Dottie.